By Darren Stevens in Culture. Updated on November 1, 2018 . Say you’re starting a new online shopping site, and you imported thousands of products. Now you need to tag and categorize them, a job which seems tedious and will take many hours of work. You could do it all by yourself, or you could outsource it to crowd, and the action of outsourcing a task to the undefined public is recognized as crowdsourcing. In crowdsourcing, you can outsource the task to not only a small group of person, but also tens of thousands of people. That’s the genuine advantage of the crowdsourcing, bringing in mass intelligence to solve problems of all kinds with affordable price. 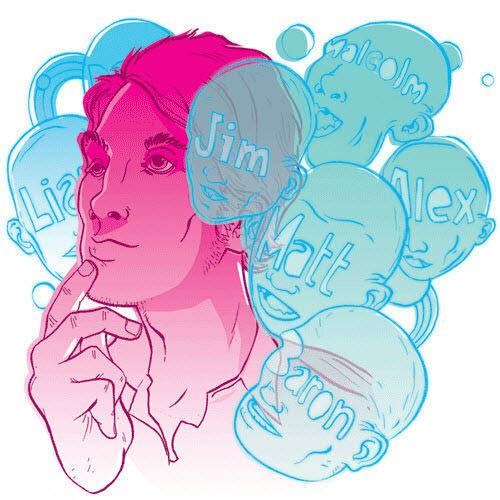 The question is, is it really intelligent to use crowdsourcing? What are the tasks well suited for crowdsourcing? What are the quality crowdsourcing services? In this particular post, there’s gonna be an answer for all these questions. Full discussion after jump! The term “crowdsourcing” was coined by Jeff Howe back in 2006, in a Wired article which described a new way of sourcing people who are willing to help or work on a project. Enough people with sufficient time can transform into a lot of available manpower. 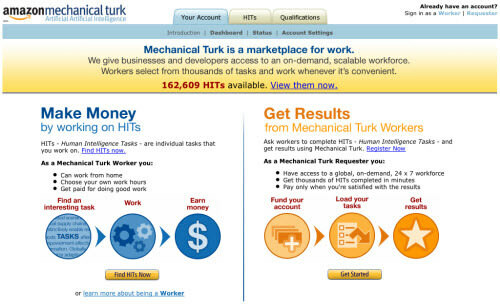 For small, manual tasks such as tagging vast amounts of photos, instead of outsourcing to a large company, it’s more feasible and affordable to use a crowdsourcing marketplace like Amazon’s Mechanical Turk. Despite being a somewhat new term, “crowdsourcing” has been existed in our society for years in many forms. For instance, video game’s beta invitation is a form of crowdsourcing, where a developer releases a beta version of the game to the public for testing. This has been going on in the software world for years, where certain software are tested by crowdsourcing companies, while others are tested publicly. Crowdsourcing is often used for translation service. For instance, Facebook has been using crowdsourcing to translate its website into different languages since 2008. Wikipedia can be categorized as crowdsourcing as well: an encyclopedia written by people from all over the world, professionals and amateurs alike. Crowdsourcing has been with us for a while and now, it just got a catchy name. Companies nowadays not only employ Research and Development (R&D) teams, but list the problems they’re working on to the public as an attempt to get help from anyone. Certain companies even offer huge prizes for solving a problem on crowdsourcing site like InnoCentive, and the cost is fairly cheap compared to employing a huge R&D team. Crowdfunding: Projects are funded by a large group of people, like most charity events. Kickstarter is a great example, which millions of dollars are funded into all kinds of projects from movies to gadgets – with all the funds coming from people interested in supporting the project. Crowdsourced design: Projects are funded for a large group of people to design something, for example, a website. This has the negative effect of “too many chefs in the kitchen”. Crowdwisdom: Where users ask questions in front of a large pool of people willing to answer, like Yahoo Answers. A more serious form of crowdwisdom can be found at InnoCentive, which is a community where large corporations post technical or scientific problems to people who can help to solve the questions. More famous examples of crowdsourcing include the Netflix Prize, where Netflix invited people to improve their collaborative filtering algorithm and offered a $1 million prize for it. With the crowdsourcing also comes the issue of management. In most cases you have to manage a large scale of workers, which pretty much waste more of your time for management instead of solution. Besides, it’s difficult for collaboration between crowd members as they compete with each other in nature. Worst of all, there’s no contract in most crowdsourcing cases. Workers can run anytime they want, and your design might be reused in anytime. As previously mentioned, crowdsourcing is best suited for simple tasks. For instance, crowdsourcing is a great option for web designers and designers in general to get some usability feedback on their work before making it public. If you’re looking for a new logo, hiring a professional designer is an option, but if you are a startup and you cannot afford such professional, you can consider placing a competition on the crowdsourcing site to get the product with an affordable price. Anyone building a huge library of photos, products, etc, can easily take advantage of crowdsourcing features. You may be building a new online shopping site, where you could use crowdsourcing and pay a few cents for people to describe, categorize or tag the inventory. Or perhaps you’re working on a new website design, you could ask people to fill out a questionnaire regarding the new design, and from there you can get some inspiration. So you see, crowdsourcing sounds not that bad unless you’re into a very serious works like developing a mobile game or corporate e-commerce site which require not only expertise but intensive management. Don’t be too cheap. Crowdsourcing is cheap, but it follows the same formula of other jobs: the more you ask from the people, the more you have to give in return. If you ask the people to spend 10 minutes filling out a questionnaire, it’s unreasonable to offer them 10 cents. Hardly anyone would bite on that deal, and those who do, the results won’t be useful to you. Have a way of verifying the results. When outsourcing to a large crowd of non-professional workers, the results can vary greatly. Make sure to state in the job description about what skill or knowledge is required from the user. Weigh your options. 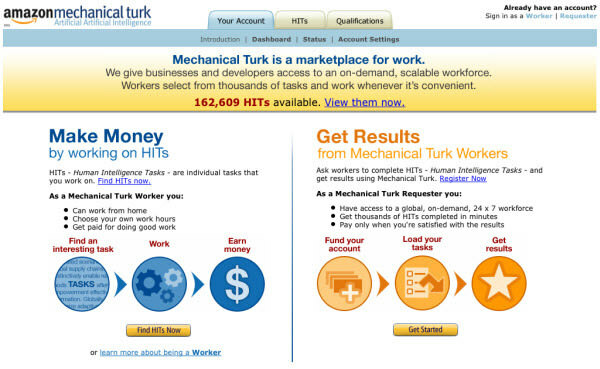 Instead of Amazon’s Mechanical Turk, consider using dedicated crowdsourcing services for things like usability testing. While they certainly cost more, they are a lot more likely to yield better results. Finally, you don’t necessarily have to use a crowdsourcing service if there is any person around you who is interested in helping you out for very minor tasks such as getting basic feedback on a design. You can also share the design with your fellow designers, or post it on portfolio site like Dribble and ask for feedback. There has been a boom in sites and services that offer the power of the crowd to everyone, from individuals needing a simple logo for their website to large corporations looking to solve some of their toughest problems. Below are 13 popular crowdsourcing sites which you can seek their help for any of the related tasks. Famous crowdsourcing site which offers online jobs to freelancers from around the world for everything from design to web development to programming. Companies or individuals post projects for a set price, whereafter freelancers bid on the jobs and offer their services. 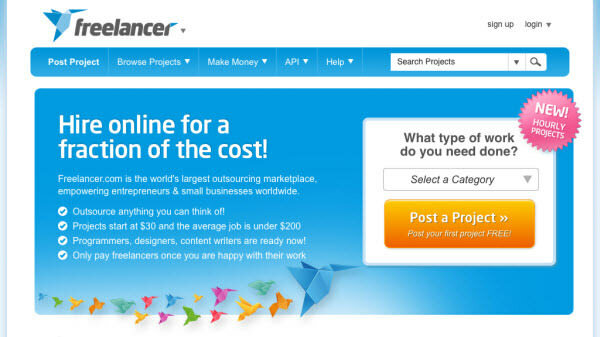 Similar to Freelancer.com, Elance is one of the most popular crowdsourcing sites online, with over 50,000 jobs posted on the site each month, ranging from programming to designing to writing. 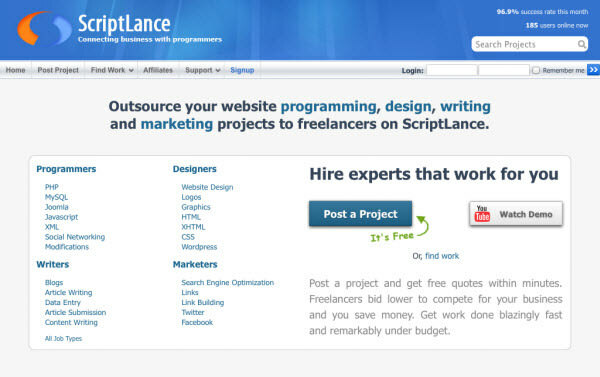 Designed for those looking to hire programmers and software developers, ScriptLance is the place where employers post a job, and developers from around the world will bid for the work, with each offering his/her own rate. Guru is the online service where jobs are offered to a wide variety of freelancers, who bid on projects ranging from programming to design to business management. Posting a job on Guru.com is free, while freelancers will pay certain percentage of their commission to Guru. A crowdsourced marketplace for all sorts of graphic designs, where buyers post contests for anything from logo to website design, and a large pool of designers submit their designs and bid on the project in an open competition. 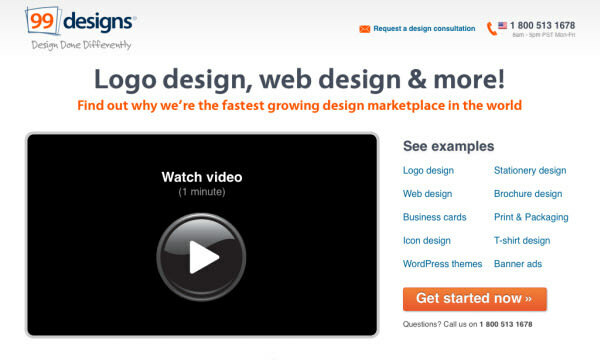 A marketplace for graphic design. For instance, an ad agency will place a request for a logo or a band will request a CD cover design, and several designers will compete for it. There is average of 110+ entries per project, and price per designed project range between $200 to several thousand dollars. Hatchwise is similar to 99designs: design requests are submitted as competitions, where designers would submit and bid on the designs. It is especially useful for those looking for a logo design. 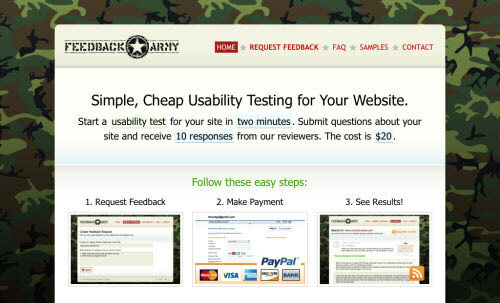 Utest is a company that offers software testing that relies on crowdsourcing. 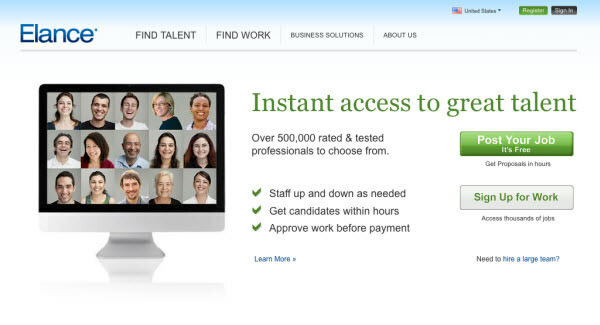 Software makers use Utest’s service to test their desktop or mobile software with large amounts of users. The tests include security testing, functional testing, usability testing etc. For an affordable price you can get video of a visitor speaking their thoughts as they use your site, and a written summary describing the problems they encountered. One of the most popular crowdsourcing sites, useful for simple tasks like tagging photos, categorizing products, etc. 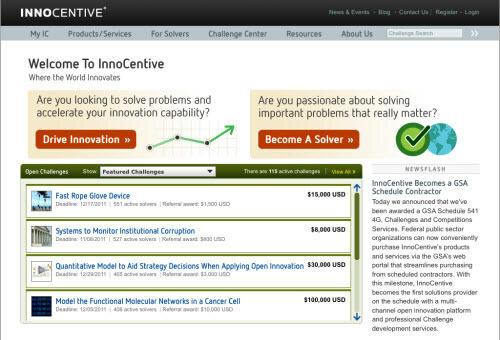 InnoCentive is for those looking to solve complicated questions, but it charge accordingly. The company claims to deliver breakthrough ideas and solutions at lower cost, in shorter time, and with less risk than previously possible.